In this video we will discuss IIF function in SQL Server. Example : Using IIF() function with table data. We will use the following Employees table for this example. 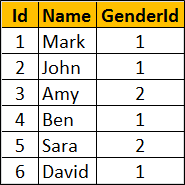 Write a query to display Gender along with employee Name and GenderId. We can achieve this either by using CASE or IIF. Can you upload videos on SQL Jobs? What are difference between Truncate and Delete and Drop in SQL Server ? 1:Truncate is DDL Command where as Delete is DMl Commant. 2:Delete command can be delete all or selected data from a table with where condition where as Truncate delete the all data from a table and we can use filter criteria in truncate. 4:Trunacte command reset the identity column where as delete command cant be reset the identity column. but in case of truncate it's not possible to use rollback the data.